Borage has been used for herbal healing since at least Roman times. Recently, you may have read about its effectiveness in treating the inflammation associated with rheumatoid arthritis. It's an interesting herb with a lot going for it -- but there's some controversy associated with it too. Borage is most often sold as a concentrated oil to treat arthritis (and also as a source of gamma linolenic acid). Since there can be side effects like liver damage from using too much of it, you'll see as many discouraging warnings about using borage oil as there are testimonials. Adding large amounts of fresh borage to your diet may also cause problems as the plant contains some dangerous compounds that don't exist in the oil. This can make borage a complicated herbal remedy you should discuss carefully with your doctor and evaluate thoroughly relative to other medications you're taking. Borage can also cause premature labor, so it should be avoided by pregnant and nursing women. I've grown borage for its flowers. As an edible decoration, borage flowers are generally considered safe, but there may be some slight potential to cause allergic reactions. 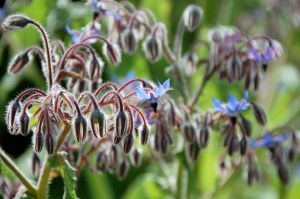 Borage flowers are often included in published lists of popular edible flowers. They're small, bright blue, star shaped blossoms that can be sugared and added to cookies, cakes and other desserts. They're also very pretty when frozen into ice cubes. It may sound silly, but if you've ever seen a drawing of a whimsical fairy and thought it looked delicately lovely, you'll appreciate the petite appeal of borage blossoms. Enhancing a dozen cupcakes for a birthday party, they're uniquely charming and worth the effort. I've also used young borage leaves (and later the flowers) in salads. The leaves give salad a light cucumber flavor, and it doesn't take many to do the job. Stick with the young leaves, though. As borage matures, the leaves become hairy, prickly and unappealing. Borage is an easy to grow annual that thrives in poor soil. It likes good light and regular watering, although it can survive a dry spell if you mulch it well. Growing to a height of around two feet, borage is no beauty. It doesn't require staking, but the leaves do look floppy and hairy. It spreads out quite a bit too, so be sure to give it a three foot space in your herb patch. Its one saving grace in the garden is that it creates many clusters of startlingly blue flowers. A prolific self-seeder, once planted, borage will come back year after year. You can propagate by division and from cuttings too. Over the centuries, borage has been known by many wonderful names, including: Bugloss (don't confuse it with Anchusa officinalis), tailwort, bee bread, (or bee's bread) cool tankard, and starflower. Bees love borage, and bee honey made from borage flowers tastes particularly sweet and flavorful. A few summer's ago, I kept borage and hyssop plants adjacent to one another, and that corner of the garden looked like a bee convention all summer. Honey bees need all the help they can get these days, so consider planting one or both of these bee loving plants for them if for no other reason. Houdret, Jessica. "Practical Herb Garden". Anness Publishing Ltd. 2003. A Frances Tenebaum Book. "Taylor's Guides - Encyclopedia of Garden Plants." Houghton Mifflin Company. 2003. I grew borage last year with my strawberries. Both went crazy. I love the Rachel Morgan (Kim Harrison) books too. I almost named my cat Jenks. Is borage safe to use in cooking/baking as there are only small amounts of it entering the body at a time? Or is just certain parts of the plant? It seems like a very interesting herb that would be fun to cook with. Do the flowers make a nice tea? Speaking for myself, I've used borage flowers and the young leaves in salads with no problem at all. If I were just starting out with the plant, I'd taste a little (and have my family taste it) before I began using it as more than a garnish. I wouldn't serve borage to any woman who was pregnant or nursing. I've never used borage flowers in hot tea. I have used them -- frozen in ice cubes -- in pitchers of ice tea (very pretty and unexpected. Before using borage for medicinal purposes - always check with your doctor. I never thought of having other people taste an ingredient when I'm cooking; they just try the entire dish. I only just convinced my mother that salads were good with more than lettuce and dressing in them, dandelions are still on the 'weed' list to her. My doctor tends to just roll her eyes at me when I ask about herbs/plants. But I'm good about asking. I've made some mammoth salads in summers gone and added dozens of ingredients to the mix. If I don't tell my husband what the more esoteric ingredients are and give him a chance to sample them -- he won't touch the salad and all that hard work is wasted -- garbanzo beans, tomatillos and calendula petals anyone? When you call it a "prolific self-seeder" - that's an understatement. I planted two borage plants one year. The next year I found about 40-50 seedlings, some of them nowhere near where the borage had been. I'm almost reluctant to try it again, but it brought bees to the garden like nothing I'd ever seen before. Is Borage a good herb to plant with tomatoes to keep the bugs away? When planted with tomatoes, borage helps repel hornworms. It has a strong smell that can be effective at repelling other pests as well. Honey bees love borage. It also attracts wasp varieties that feed on destructive garden insects, so planting it in your garden is a two-for-one. I am growing borage for the first time this year, right alongside my tomatoes. They have been very successful at attracting bees - both honeybees and carpenter bees. But you're right - they are not pretty, and I've spent a lot of time peeling off withered brown leaves. I plan to plant a LOT more next year! That's the spirit! Beauty isn't everything. can we feed them to goats?, who are always hungry, but it turns out not everything is good for them! Can anyone tell me how much space I need to allow for borage?? I want to plant some amongst my tomatoes but I don't know if there is enough space. You need at least 18 inches (45.72cm) between plants.Twenty two inches (55.88 cm) is even better.